From the Shortcuts form, click on Calendar, then from the calendar tool bar click . From the contact's profile toolbar, click . 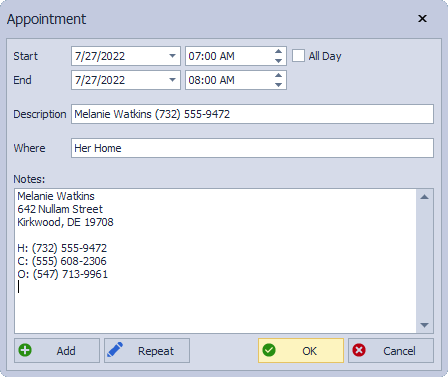 From the Customer, Unit or Address List, select the contact, then right-click and choose New Appointment. From Upcoming Events under Appointments, right-click and choose New Appointment. Enter a Start and End Date and times, or check All Day for an all day appointment. Enter a Description, location and any other pertinent notes. If the appointment is recurring, click Repeat and enter the appropriate information under the Frequency and Duration sections, then click OK .
To finish adding the appointment and create another, click Add , otherwise click OK .